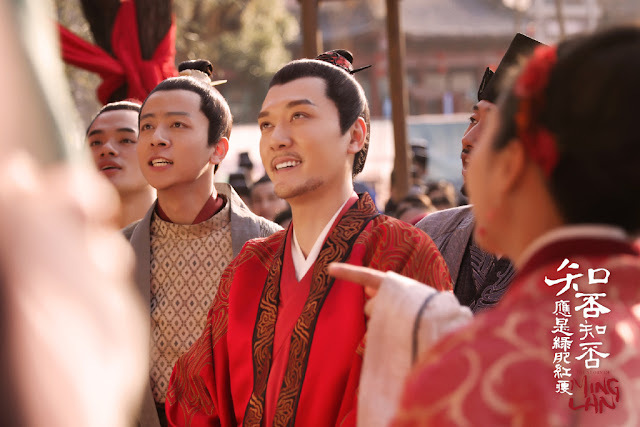 The latest developments in The Story of Minglan 知否知否应是绿肥红瘦 have been pure bliss and a stark contrast to the tragedy dealt in past episodes. 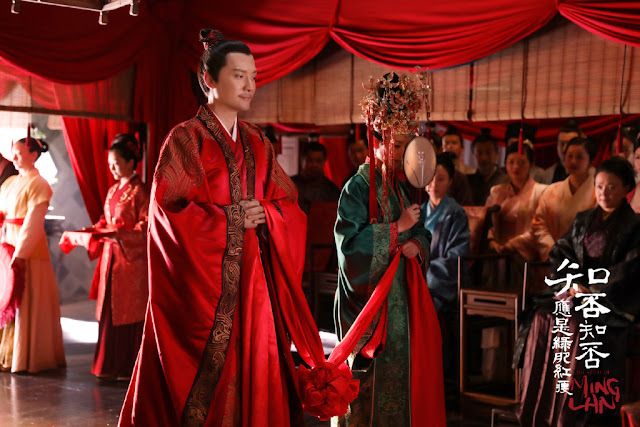 With their separate storylines finally converging, Gu Tingye succeeds in pursuing Minglan and they get married (this happens on episode 40)! 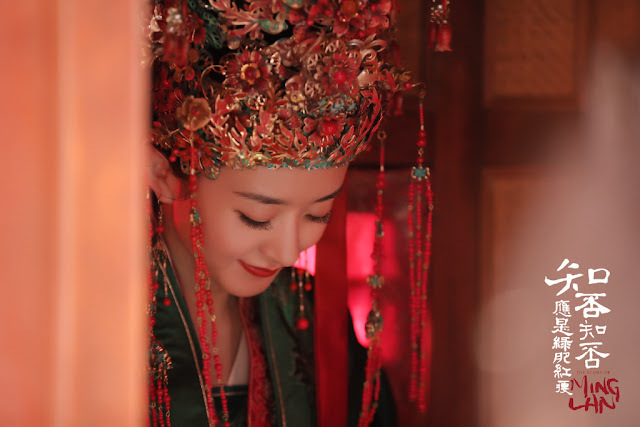 Truth be told, I started the show mainly for Zhao Liying, more so because it's her drama with real-life hubby Feng Shaofeng though it didn't take long before I was completely hooked to everything else about it. Despite complaints about the slow pace, I wouldn't have it any other way because even as the characters go about dealing with the most mundane of things, it is masterfully depicted and feels like a necessary progression in a story that's simply about the lives of these big families in ancient times. Who would have thought that surviving in a big household would be so difficult? The lows were depressing but the highs are so rewarding. I love that the show literally spared no detail in terms of the wedding to make it equal parts touching, humorous and realistic. It follows the bride getting ready and having a slight case of cold feet until the moment that the lights dim on the newly weds first night. Grandma crying on Minglan's big day was the most touching scene for me. And I had to laugh when the groom told his new wife to remove her gigantic headpiece. Surely, her neck must hurt under all that weight. It's a new life for Minglan and nice reprieve from the infighting, but after that, it'll be another battle, I'm sure. Just a change in battlefield. This is what I called acting. Less graphics/CGI, so it’s up to the actors. Slow, but it has fleshed out the characters. You nailed it right there. I really like the way the stories pan out and explain each character. I know some people find it a tad slow but I really like it. You get to really know the characters well and I must say that they have good quality actors and actresses. Each emotion, each potrayal was vivid. I am totally hooked on this drama. Not sure if you guys really watched it or breezed through it. Tons of Chinese people who watched it were angry at ZLY's performance in this drama, especially during the wedding scene how she did not portray the correct acting of sympathy toward the grandma. There is a saying "There is no small character, only small actor" meaning the people who play side characters like ManNiang still did better than ZLY. ZLY couldn't walk correctly like an ancient young lady, she is always swaying and waddling like a duck while, even people like ManNiang is convincing. The ratings of this drama may be high but that doesn't mean anything, lots of the honest reviews show that this drama isn't any good. Even people like ABB is honest with her ratings, General And I was so boring and slow but still faster than Minglan, and ABB did not turn herself into a rating queen just because her drama is airing. If ABB was playing Minglan instead, nobody would step out to protect this drama. All the slow pace and non existing storyline... only ZLY fans would make up funny excuses for everything. There was not even a conflict in the drama and the fans would still protest that there are. She is really teacher Zhao Gao calling a deer a horse. I did not realised there were so many negative comments on ZLY...Her charcter is well written but I do find her acting is slightly weak compared to others. Nevertheless I do enjoy the drama. Haters just mad Zhao Liying has a good role. Minglan has learned to guard herself since she was little. She kept some things from grandma because she’s afraid to make her worried. I think ZLY REALLY knows how to pick her dramas but her acting is just meh. It's been 40 eps and I don't really see a spark in Minglan. I kinda wished the lead roles would've gone to fresher actors as ZLY has been the main lead in back to back dramas for the last 4? years and the male lead is so old lol. The kid actors were great though. I think the supporting cast really make this drama. ZlY is not the best actress out there but she is one of the best of her group. At not point does her acting take away from the story. I personally think that she adds to the emsemble cast. Now is she the best actress in this drama? Imo no because the drama does such a good job in portraying all the secondary characters that actors get to shine. If ZLY was not playing Minglan this drama wouldnt have gotten the funding it needed and it wouldnt be doing as good. Can producers sell a drama with an unknown or up and coming actress for the same price as one of the top leading of ladies? Nope. If rumors are true Hunan paid a lot for this drama and it paid off for them since it is their highest rated drama in over a year. "Can producers sell a drama with an unknown group..." Yumama did it successfuly with The Yanxi Palace. Nie Yuan and Charmaine Sheh were not famous anymore, after the drama, they found their success once again. Main leading girl was new and did excellent, all supporting casts did awesome as well. The secondary characters in Ming Lan are only slightly better in acting than ZLY and their characters probably only have a little but more depth... or maybe their characters do things that make more sense. But it's not like they are super surprisingly awesome. In fact, they actually dragged out the drama way too long sometimes and was the cause of the "boring" and slow pace issues. I feel tat people liked Zhu Yi Long the most, but he got famous way before Ming Lan came out. He got himself lots of fans watching the drama because they love him, not because of the character he's playing in Ming Lan. I cannot agree with that "...she is one of the best of her group"
Liu Shi Shi is exactly in her age group, it is only that Shi Shi have aged... other wise ZLY does not compare a candle next to the super talented Shi Shi in every way. Also, ZLY tend to act with uglier or unknown actresses than herself so nobody can overshadow her. Or when somebody pretty like Li Qin act with her, then their roles are the most annoying kinds they have to play. Liu Shi Shi, Ariel Lin, Yang Mi, Tang Yan, Angela Baby, etc. all have at least once acted with very famous and beautiful people at their level before. They did it gracefully without fan fights too. @6A: even thru I agree with some of your comments. Nut I have to add, Yumama is not a good example. Yu Zheng sells his drama based on his own name alone. As long as he produces any drama, he will get investors. As many of his dramas sells. Some dont do as well but they are still okay. Yu Zheng dont need well name cast to sell a drama. As he has a eye to pick good cast for each part. And his investors trust his works. Like someone else said Yu Zhengs name is what it takes to sell a drama. In fact ZLY's first leading role was in one of his dramas. As for ZYL. Most of his fans are still those from guardian creating a lot of buzz online. Fan favorite due to the drama would be the actress playing big madam. @6b hmmm a lot of those names are regarded as weaker actresses than ZLY. I adore LSS, but she is not considered a strong actress. AB gets hate in all her acting roles and she has no hit drama. She does better in movies, I personally think she is more of a movie star. Now both Tang Yan and Yangmi get a lot of mixed reviews. But in terms of star power and dramas becoming a hit then Yangmi and ZLY are probably the best paid ones. And ZLY is regarded as having some of the best acting chops among this group. Which is not impressive since it is a weak group of actresses. None of them have ever wowed me with their acting. I think Li Qin is a very good actress, better than ZLY but she is of a different generation. Sadly, she is not that popular. I would say she and Yangzi lead their group acting wise imo. As for the post 85 generation, in general regarding the popular celebs none of them are regarded as great actresses. "As for the post 85 generation, in general regarding the popular celebs none of them are regarded as great actresses." I disagree. Besties Zhou Dongyu and Ma Sichun, for instance, are popular celebs who have also won acting awards, most recently a joint Golden Horse (the most prestigious in Chinese-language cinemas) awards for Best Actress. Yang Zi is also regarded a talented actress, her best showcase is the Battle of Chang Sha. Unfortunately, the ones that make her popular are the xianxia ones. Agree with 6.e. I really like Zhou Dongyu, her acting is very professional. And I find Ni Ni really talented in acting too. TIna Tang Yixin is good but she haven't been in any good dramas or potential character role. Sebrina Chen Yao and Yang Caiqi don't do much but they are very talented too. Hu Bing Qing can act decent but landed very terrible roles and storylines. I like this drama and I am not a fan of any actor in paticular. 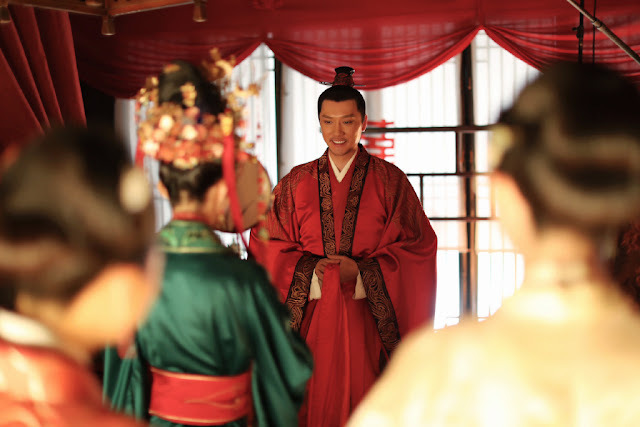 Maybe it is not the best, but it shows different side of traditional China that you rarely see in dramas. LOL ZLY doesn't look her age because she'd done lots of botox and plastic surgery. She is in the same age group as LSS and YM, when they were all 18, LSS and YM were pretty and ZLY only looked like an old lady. When LSS and YM aged, ZLY botox her face to be the remaining person who still look like a kid, what is so special because anybody can do that too. Ariel Lin still looks young, and it's n-a-t-u-r-a-l-l-y young. It's so wrong to compare ZLY to Ariel. They're both from really poor background but Ariel never media play about her poor life to gain sympathy from fans the way ZLY did. ZLY can never play roles like Ariel Lin too. In terms of looks, personality, acting, ZLY is way behind. IWNLYG is nothing but a spunky drama with lots of plot holes, but it is still entertaining. And it is amazing because it made itself to 2nd rank as most watched drama without cheating and media playing. Anon 9.a, you obviously are Zhao Liying hater who sound very much bitter that Story of Minglan is doing well both on TV and online rating. Bet most of the bitter comments on this article are from you. Not surprised people can be so bitter since this drama almost surpassed 2% on tv rating. It also got relatively good douban rating (7.6) compared to other period dramas which mean the quality and good production is there. After all dramas produced by Daylight are all decent in quality. Stay bitter and salty because a lot of people love this drama for its good slice of life story. Slice of life genre isn't for everyone, you either love it or dislike it. It can be slow paced and have no clear storyline direction because it's meant to tell story of everyday life during a certain period time for people to take life lesson or to relate with them. Just like Korean drama Misaeng, Reply 1988, Ode To Joy and First Half of My Life. If you dont prefer these kind of shows and genre, then you don't have to bother yourself with watching it and shoving your unreasonable hate towards this drama. Everyone can have their opinion true but when you're being rude and unprofessional, even slander a celebrity without any concrete proof, your opinion is no longer valid because you are just pure hater. A childish one at that. Whatever you may say, Zhao Liying is still considered one of the better actress in her age group. She may not be great but she has never ruined a show because of her acting nor has she ever got so many flak unlike Zheng Shuang in Love 020 or Angelababy in General and I or Yangmi in her past dramas (I like her now since she has improved a lot). I'm gonna end it here because I'm not about to entertain a childish hater like you. I can't possibly be all the users in that forum. 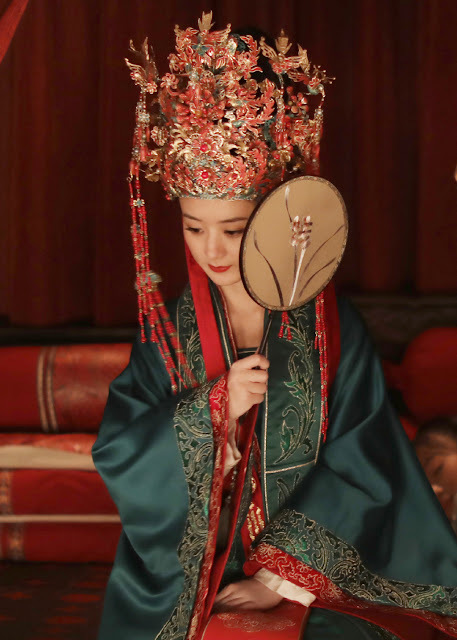 ZLY performance as an actress is not truly that well received, and Ming Lan is not totally that well loved. Everybody finds the drama very boring, actually almost all her dramas are very boring. No way to keep comparing Ming Lan to dramas like Ode to Joy, etc. 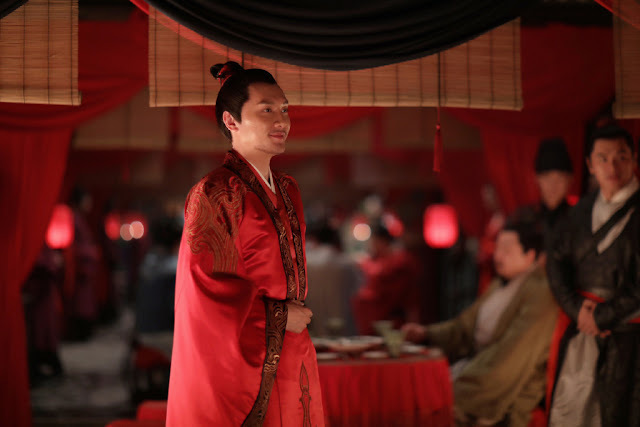 Don't tell me Nirvana in Fire is going to be next just because of a Daylight thing. Well obviously ZLY must be doing something right that ppl from all over the world r drawn to her, she is a ppl-magnet even those who claimed to hate her and critisized her by placing comments (which has no effect on her popularity whatsoever) r also drawn to her as they see her name or her dramas headlining anywhere. No people don't look forward to her new dramas but they always promote her everywhere to the point we not even looking but they force it in our face to see. I always give her a chance and watch the new stuff she have but they're always so disappointing. And what's more, her fans would step down on anybody who is getting famous. Example, Zhu Yi Long since he's not riding on her fame like what usual actors always do. It became a fan war. Every time there's always got to be 1 person who is going to fight with her, about who's more popular or getting more scenes than her. It's not people are drawn to her, and not that she's the only best one alive, her fans are shunning every new actresses away from being able to emerge out popular. That's what they care only, they don't care about her acting skill and the type of drama she play in. Remember when Yang Zi was stepped all over in Qin Yun Zhi? YangZi was criticized bc of the character she played. She still gets hate when she picks characters that are supposed to be otherworldly beautiful. As if it is her fault that 99% of characters are described that way. She and ZLY have a good relationship and even opened up a restaurant together and I havent seen arguments among their fandoms. There were angry book fans when the drama aired bc YangZi's character is the lead in the book, but the drama made ZLY's character more of the lead so book fans were unhappy which is understandable. I did see some fanwar among ZYL fans and ZLY fans but it was because some of his fans were saying that the high ratings were due to him, which is a stretch considering that he is not well known among TV audiences. ZLY is a very popular celeb whether you like her or not, there is no use denying that. She is also popular among international fans. It is also unlikely that international fans would be able to follow all cent gossip, but her dramas get licensed abroad and it increases her popularity. It has very little to do with her fans. @anon 10a..You are obviously a hater. Caling ZLY ugly when she was 18, are you perhaps blind ?? She wasnt drop dead gorgeous like ABB but she is pretty and cute in her own way.I dont know if she done botox or not but if she does, she isnt the only one done that. Many actresses and actors done that as well.I actually think that ZLY isnt as young looking anymore. You could actually see her nasolabial lines and her face volume reduced a lot from her Hua Qian gu days. And Fans would be fans as well, they would fight with each other. As long as you are mature enough,you would ignore all of those fans fight and focus only on the actor projects.For example : Yang mi and dilraba fans also keep fighting as well, even when yang mi is dilraba's boss. Are you also @anon6b who said that ZLY always act with actress that are uglier than her ?? Then are you calling yang zi,tang yixin, jiang xin,zhou dongyu ugly as well?? Because they dont look ugly at all to me. On PA,the beautiful Li Qin got so much praise not only for her beauty but her performance as well.The only reason why Li Qin name is still not on the top was because she tends to pick bad dramas . Oh i almost forgot, on Chusen, when ZLY was named replacing ABB, she got a lot of hate bcs the book fans was afraid that she wouldnt died in the end, but ZLY still died then. Chusen is still on going, they re preparing for S3,YZ character would get the guy in the end,but she has another project so someone replace her. I would said that ZLY acting is the best, but she is quite good at acting natural.On MINGLAN,her face expressions are on point, but yes her posture and the way she walks are lacking. I dont see these problems on her other costume dramas though, so idk why she decided it s okay to not have straight rod spide. On her expression at the wedding day, i believe it was intentional. Because she didnt want her grandma worried more and didnt want rumours that she's unwilling and was forced to married GTY. Bcs it would also smear GTY name as well. Her grandma also said on the night before her wedding, "she should happily leave the gates of this house on her wedding day." yang zi,tang yixin, jiang xin, are all very good looking. But look at the roles they play next to her? They are really lack lustering roles, and most are even just the usual annoying B's roles. The only exception was zhou dongyu because ZLY wanted to try an evil role that didn't go too well. So no one is asking why Minglan's wedding dress is primarily green instead of the bright red that is to be the traditional wedding dress? Is it due to the book title or is there a historical cultural reason that I am not aware of? Green can be good or bad, but the cantonese use "green Hat" as a girl who had an affair with another guy..so can someone explain why the dress is green? I read on Weibo Green signifies Minglan's low status in the Song Dynasty. Only those of high status wear red. This is also partly why the title is as such, to portray the oppressing lives of women in that time. Dang, 30 comments! I'm not a die hard ZLZ fan but drama is so good. It reminds me of Pride and Prejudice: women-centric, focuses on the domestic life, and especially marriage, and really just about the mundane happenings of life ... but somehow every line, every scene, every character, every turn of event is important and exciting. I wouldn't call it slow-paced. I mean, it feels slow but things are always happening. I also enjoy a story where both main characters are quite clever. I don't care about the bad comments,i just like this drama,all the actors and actresses are good.